I’ve been thinking about doing this for quite some time, but I never got around to acting on it. Then I saw a video for a recipe for our new NuWave oven in which the chef was using them and I decided that it was really time to do it. What she was doing was wearing disposable gloves while handling chicken. When I’m working with something like chicken I end of washing my hands four or five times because I don’t plan well. I’ll pull out the chicken and realize that I haven’t gotten my knife, so I need to wash my hands. I cut the chicken, and realize that I haven’t gotten the spice mix out, so I need to wash my hands again. ARGH! I looked at the grocery store and they had 12 for $1.99. Not ideal. So I checked Amazon (where else?) and found a box of 500 for $8.99. Much better. I’ve only used them a few times, but I think the gloves will help me to be better organized in the kitchen. Get out the knife. Get out the spice mix. Put on the gloves and cut the chicken. Put the chicken on the NuWave rack. Take off the gloves and throw them out. Season the chicken. If it works it will be a big improvement. I have a son-in-law who is a professional cook. 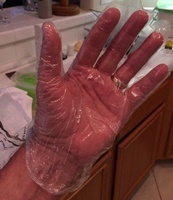 He wears disposable gloves in the kitchen all the time and I have picked up the habit from him and my daughter. Pie crust is flakier if mixed by hand; my homemade granola mixes better before baking; meatloaf which I used to mix with bare hands now is much less messy with gloves. And the list goes on. I hope you find a lot more uses in your busy kitchen than just the chicken. Tahoe Mom, I have indeed. Last night I chopped up flap meat for tacos using them. As they keep saying on Food Network, the best kitchen tools for mixing is with your hands. If I do so with disposable gloves, so much the better!